The Odor-Eaters Rotten Sneaker Contest, open to children ages 5-15, is now in its 39th year. The first contest began when a Montpelier, Vermont, sporting goods store owner sought an interesting way to advertise a new line of athletic shoes by giving away a free pair to the person who could produce the most rotten pair of shoes in the country. Odor-Eaters — a manufacturer of shoe insoles, sprays and powders, joined as the official sponsor in 1988. Judges included: George Aldrich, a Chemical Specialist at NASA; Rachel Herz, author of That’s Disgusting and psychology of smell expert; Claudio Schapsis, Marketing Director of Ripley’s Believe It Or Not Museum; and Buck Wolf, executive editor at the Huffington Post. Fourteen-year-old Alex Berner gave Jordan Armstrong a run for her money by wearing shoes without socks, but left with an honorable mention. This year’s grand prize winner, Jordan Armstrong, confessed that she never takes her shoes off. She has been wearing them non-stop for the past four years — to parks, to school, in walk-a-thons, to sports practices, and even to bed! Her once-white Converse tennis shoes had been patched with pink cheetah duct tape when they sprung a hole. The smelly shoes were so potent that her mother made her store them in a plastic bag. The lucky gal received a two night’s stay in New York City, Broadway tickets to see The Lion King, a Golden Sneaker Award, a supply of Odor-Eaters products, $2,500, and a special place of recognition in the “Hall of Fumes” Museum. 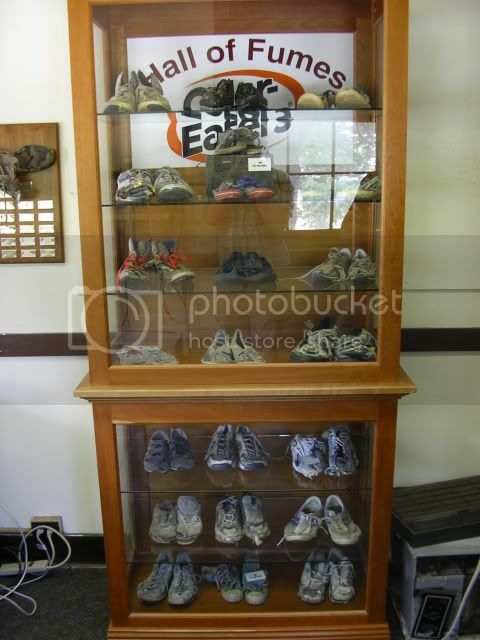 The Hall of Fumes in Montpelier, VT, features the nation’s smelliest shoes — encased in glass, of course! For the Rest of Us: Let’s Prevent Smelly Shoes with UV Light! Let’s face it: not everyone can be a champion. If your shoes can’t win you thousands of dollars and a trip to New York, then you may as well try to prevent the stench using the latest technology. Recognizing that it’s bacteria which causes the hideous odor in footwear, we invented a patented UV light shoe sanitizer to help you get cleaner, fresher shoes in just 45 minutes! One pass will kill up to 99.9% of the microbes living (and stinking!) inside your footwear. Get one for your family today! Is Stress Causing My Smelly Feet? Spa Stigma: Can You Get Your Nails Done If You Have Toenail Fungus?